William F. Finlayson is a native Long Islander, and has been a Civil War buff for over 50 years, becoming interested as a small child. He received a BFA from San Francisco Art Institute, and is an avid collector of books, prints, and artifacts. He is the newly elected Vice President of the CWRT of New York, and is a founding member of the North Shore Civil War Roundtable. He has spent many years researching his Civil War ancestors, and the topic of his talk is: A Family Goes to War - The Toffeys and The Wordens. Those of us who know Bill, will know him as incredible resource of the Civil War. He has always been willing to share with us his remarkable collection of artifacts and prints at our annual “Collector’s Showcase” meetings and more recently at our “Welcome Back Warmer” this past September. 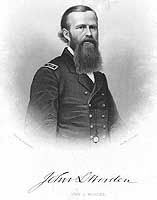 One of Bill’s noble ancestors was Lt. John Worden, Commander of the U.S.S. Monitor.